With the death of this courageous resistance fighter, we are now greeted with a sickening spectacle which whitewashes his history and the fact that Mandela was first and foremost a freedom fighter. Politicians and commentators in Australia, the USA, the UK, Israel, Europe and elsewhere, many of whom who had previously labelled him a terrorist, supported his incarceration and the South African apartheid regime, are now pretending they did no such thing and are falling over themselves to laud him as a hero, a great man and a man of peace. As a leader of the ANC Youth, which he helped found with Oliver Tambo and Walter Sisulu in 1944, Mandela worked to convince the ANC to adopt mass militant non-violent tactics, which included boycotts and strikes. In the wake of the brutality of the 1960 Sharpville massacre which saw 69 unarmed Black South African’s gunned down by the regime, Mandela co-founded (with Walter Sisulu and Joe Slovo) the Umkhonto we Sizwe or Spear of the Nation which carried out sabotage against both military and civilian infrastructure in South Africa. In founding Umkhonto we Sizwe in 1961, Mandela took inspiration from the revolutionary struggle taking place in Cuba, in particular from Fidel Castro and Che Guevara’s 26th of July Movement. And today, as the revisionist politicians and commentators eulogize Mandela, they also seek to scrub from Mandela’s history his lifelong and steadfast support for the Palestinian people and their struggle. Just as they were complicit in supporting South Africa’s apartheid regime, many of these same revisionist politicians and commentators are today complicit in supporting Israel’s apartheid regime. “For instance, we had the Bantustans and we had the Group Areas Act and we had the separate schools and all of that but I don’t think it ever even entered the mind of any apartheid planner to design a town in such a way that there is a physical wall that separates people and that that wall denotes your freedom of movement, your freedom of economic gain, of employment, and at the same time is a tool of intimidation and dehumanization. We carried passes as the Palestinians have their ID documents but that did not mean that we could not go from one place in the city to another place in the city. The judicial system was absolutely skewed of course, all the judges in their judgments sought to protect white privilege and power and so forth, and we had a series of what they called “hanging judges” in those days, but they did not go far as to openly, blatantly have two separate justice systems as they do for Palestinians [who are tried in Israeli military courts] and Israelis [who are tried in civil, not military courts]. So in many ways the Israeli system is worse”. 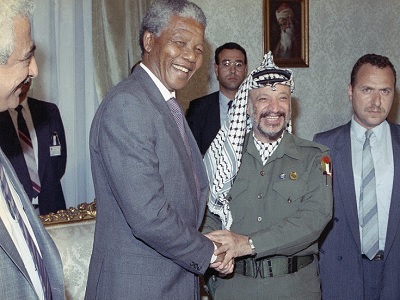 In 2012, Mandela’s party, the African National Congress (ANC) which is also the ruling party of South Africa, formally endorsed and adopted as part of its official policy, the Palestinian call for Boycott,Divestment and Sanctions (BDS) against Israel. In 2005 Palestinian civil society issued a call to the international community for a program and campaign of boycott, divestment and sanctions (BDS) to be applied against Israel as a way to pressure Israel to end its violations of international law, respect Palestinian human rights and engage in fair negotiations for a just peace. Today, Mandela is honored by both those in struggle and by those in power. Once, however, he and his struggle were demonized and hated by those in power, including many of those same people now praising him today. And while mealy mouthed politicians and hypocritical commentators sing Mandela’s praise today, attempting to whitewash his legacy, they will not succeed in rewriting history. South African apartheid may be over, but apartheid has not ended. Apartheid is still alive and flourishing today in Israel. And today, the best way to honor Mandela, his legacy and the courageous struggle that he and his people fought against South Africa’s apartheid is to take a stand in support of the Palestinian struggle against Israeli apartheid and occupation. This is Mandela’s legacy, a legacy of actions and deeds – not just empty words – in support of the struggle against injustice, oppression and a brutalizing regime which oppresses and dehumanizes an entire nation of people. As Mandela knew: apartheid was wrong in South Africa and it is wrong in Israel. Honor Mandela by joining the struggle for a Free Palestine, by joining the struggle against Israeli apartheid and by supporting the Palestinian BDS campaign! – Kim Bullimore is a volunteer with the International Women’s Peace Service in Palestine (www.iwps.info) and the co-convenor of the Melbourne Coalition Against Israeli Apartheid. She writes regularly on the Palestine-Israel conflict for the Australian newspaper, Red Flag (www.redflag.org.au). Kim also has a blog here, where this article first appeared. She contributed this article to PalestineChronicle.com. I am mesmerized by he honesty of this article and am in total support of everything it stands for. I hope this movement continues to acknowledge the freedom of the Palestinian people and the voice of those who call for it.